No one goes to the dentist for fun, but that doesn’t mean our dental surgeries should be poorly designed. While many of us have come to expect designer workplaces, shops, bars and restaurants, even private clinics lag behind. Thankfully, things are changing. 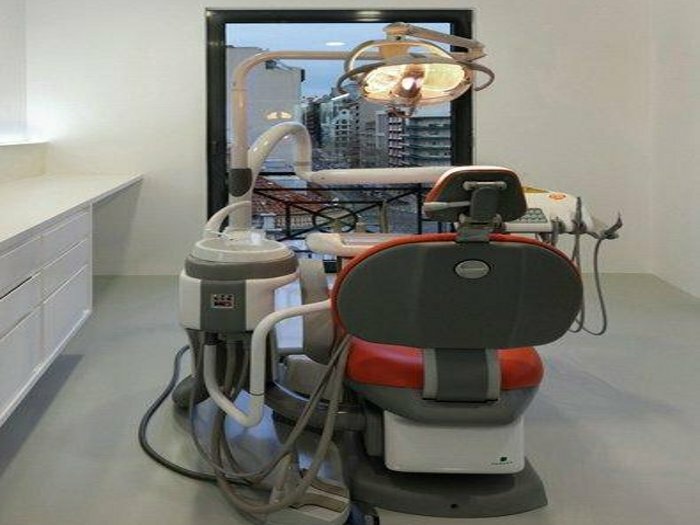 Be Clinique, a new dental surgery in Lisbon designed by local practice OPENLAB Architects, shows that good design can make a real difference to an experience few of us look forward to. 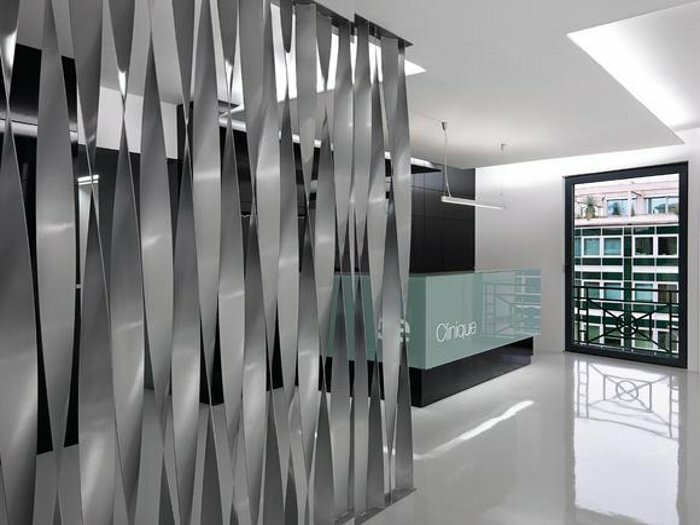 The project involved transforming a former office into a stylish dental clinic. ‘The client wanted a modern, luxurious and chic image as the area where the clinic is located is one of the most prestigious in Lisbon,’ says designer Gonçalo Guerreiro. As is often the case, money was limited and time was short, so OPENLAB Architects decided to focus on creating a good first impression: ‘The reception area and the waiting room deserved special attention,’ says Guerreiro, ‘since these are the areas customers see as soon as they come in.’ The client also specified that some of the original features had to be reused, including part of the ceiling, doors, the toilet and some partitions. 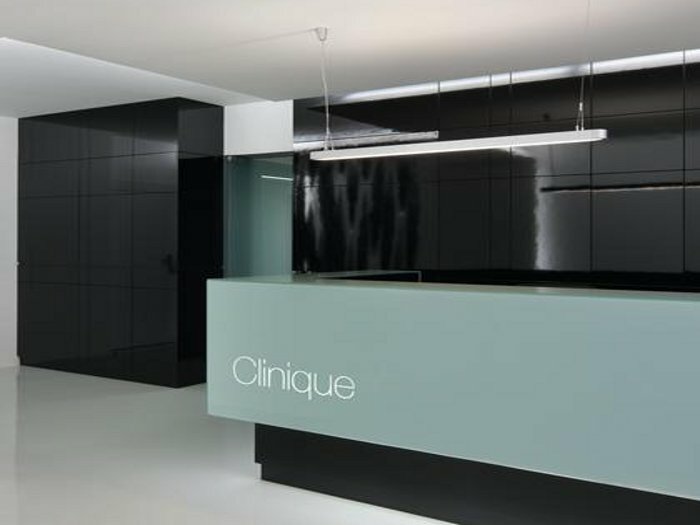 Be Clinique already had an established brand with its own colours – black, silver and greygreen– and OPENLAB Architects based the monochromatic scheme on these. The reception desk is bespoke and has a laminated glass top and Formica laminate front with the Be Clinique logo on the side. A single fluorescent strip light by Gillamp is suspended above it. As a backdrop to the reception, OPENLAB Architects designed a wall of sleek black cabinets faced with Formica laminate. The floor has a satin-finish epoxy resin coating from Sikafloor. The most unusual and successful of these is a screen made of twisted metal ‘blades’ which divides the reception area from the waiting room, creating two distinct spaces while still allowing light and partial views between them. Each blade of the screen had to be specially made by ironworkers before being arranged by Guerreiro and his team prior to welding. ‘The blades represent the irreverent element of the scheme, standing out and breaking the static feel of the remaining elements,’ says Guerreiro. Design in the five consultation rooms has been kept simple with a neutral colour scheme, and each one has plenty of natural light and city views. One of the rooms has glass walls so that it can be used for surgical demonstrations. ‘The starting point for success was when the client challenged us to push design forward,’ says Guerreiro. ‘Having the opportunity to explore different approaches and constantly discuss them with the client meant we were able to minimise mistakes and achieve a result that everyone has been really pleased with. ‘What makes it special is that we managed to realise the client’s dream, and exceed expectations,’ adds Guerreiro.